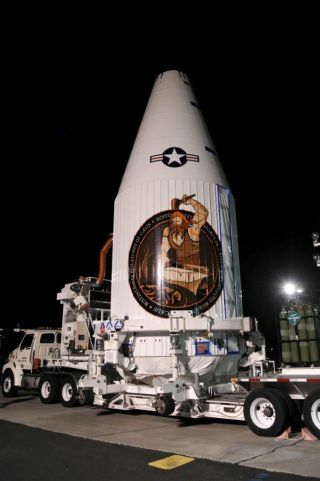 The U.S. National Reconnaissance Office's NROL-55 payload heads toward the launch pad at California's Vandenberg Air Force Base ahead of a planned Oct. 8, 2015 launch. An American spy satellite will blast off early Thursday morning (Oct. 8), taking 13 tiny "cubesats" along for the ride, and you can watch all the action live. A United Launch Alliance Atlas V rocket is scheduled to launch the NROL-55 mission for the National Reconnaissance Office (NRO), the agency that operates the United States' spy satellites, at 8:49 a.m. EDT (1249 GMT) Thursday from Vandenberg Air Force Base in California. You can watch the launch live on Space.com beginning at 8:29 a.m. EDT (1229 GMT), courtesy of NASA TV. Three of the NRO cubesats are part of a project called SNaP-3, "whose mission is to develop user software-defined radios to provide beyond-line-of-sight communication for disadvantaged users in remote locations," according to an NRO fact sheet. Each of the SNaP-3 spacecraft weighs 10 lbs. (4.5 kilograms). Two other NRO cubesats from a project known as SINOD-D, which weigh just 4.4 lbs. (2 kg) apiece, will also demonstrate software-defined radio communications, while the 3.3-lb. (1.5 kg) AeroCube-5c and AeroCube-7 craft will prove out tracking and optical-communications technologies, according to the fact sheet. The other two NRO cubesats, from the PropCube project, weigh a mere 2.2 lbs. (1 kg) apiece. This duo will perform calibration measurements high up in Earth's atmosphere. The four NASA-sponsored cubesats are called ARC-1 (Alaska Research CubeSat 1), BisonSat, AMSAT Fox-1 and LMRST-Sat (Low Mass Radio Science Transponder-Satellite). ARC-1, which weighs 2.2 lbs., was developed by the University of Alaska Fairbanks. This miniature spacecraft will characterize the thermal and vibration conditions experienced during launch and help test out new cubesat control and communications systems. Students at Salish Kootenai College, a tribal institution on the Flathead Indian Reservation in Montana, developed the 2.2-lb. BisonSat, which will perform a variety of Earth observations. A main goal of the project is to help students learn how to design, build and operate spacecraft, according to NRO officials. The 2.2-lb. AMSAT Fox-1 was developed by the Maryland-based Radio Amateur Satellite Corp. (AMSAT). This cubesat "features an amateur radio FM voice repeater that will provide easy, portable satellite communications opportunities for amateur radio operators worldwide," the NRO fact sheet states. A team based at NASA's Jet Propulsion Laboratory in Pasadena, California, devised LMRST-Sat, a 6.6-lb. (3 kg) spacecraft designed to demonstrate a new type of transponder that could help cubesats navigate through deep space, far from Earth. You can also watch the NROL-55 launch live at ULA's website, http://www.ulalaunch.com, starting at 8:29 a.m. EDT (1229 GMT). Thursday's liftoff will be the 101st launch for ULA, a joint venture of Boeing and Lockheed Martin that was founded in December 2006. All 100 of ULA's launches to date have been successful.